It’s official. Today ColaLife’s Certificate of Incorporation arrived from Bells, Wells & Braithwaite. 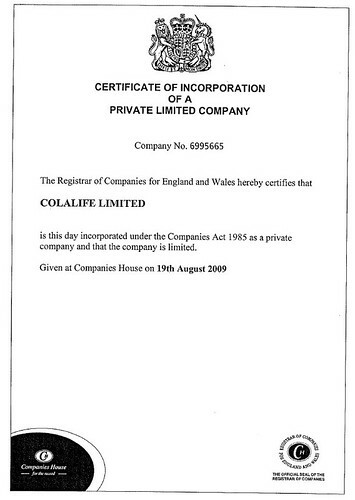 ColaLife Limited is a company limited by guarantee (non-profit). Our Memorandum and Articles of Association are here. Many thanks to Bells, Wells & Braithwaite for their pro-bono help with the incorporation. The first draft of a business plan is also on its way. Once this in place I hope it will provide enough information to enable people to sign up for board membership to take ColaLife to the next phase. The not-for-profit legal structure we have chosen will enable us to adopt charitable status or CIC status at sometime in the future if this would be beneficial. Either of these decisions would be one-way. RT @colalife: ColaLife Limited – ColaLife incorporates! https://bit.ly/15TykB <-Hooray!